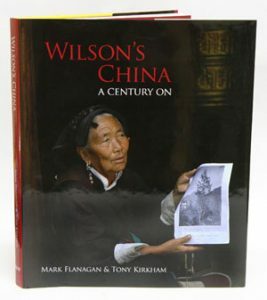 Wilson’s China: a century on. Artist/Author: Flanagan, Mark and Tony Kirkham. Ernest Wilson was the foremost plant collector of his generation, responsible for introducing over 1,000 species to our gardens in the West. The authors of this book reveal Wilson’s adventures through excerpts from his own writings as well as describing their own experiences tracing his journeys in the wilds of China today. Wilson’s legacy includes glass plate photographs taken in Sichuan at the beginning of the 20th century, depicting landscapes, villages, river scenes, people and plants, veteran and exceptional trees. Armed with copies of these images, and with the help of Chinese guides and local knowledge, the authors retraced Wilson’s footsteps, taking photographs themselves. The result is a splendid series of ‘then and now’ images which are a key feature of this informative homage to a great plant hunter. Artist/Author: Cox, Peter and Peter Hutchison. This book is the story of the extensive travels made by two Peters in search of plants in Turkey, India, Nepal, Bhutan, China and Tibet. On nearly every expedition, they explored territory where no western plant hunters had been since such great explorers as Frank Kingdon Ward, and some of the trails they followed were so remote and rough that they had never before been botanised. Every trip was an adventure, and every adventure bore the seeds of success. Where the Himalayan range meets the gorge country of south-west China lies the richest temperate flora in the world. Here the plant life can mate, mutate and migrate in an evolutionary stew that challenges the botanist to classify it. With their Chinese and Indian colleagues, the Peters introduced many plants, especially rhododendrons, new or lost to cultivation, often saving them from extinction, many of which can be grown outside in the temperate regions of Europe and the United States of America. Artist/Author: Schiebinger, Londa and Claudia Swan. 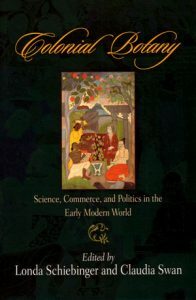 This book reveals how the study, naming, cultivation, and marketing of rare and beautiful plants resulted from and shaped European voyages, conquests, global trade, and scientific exploration. Food plants of the world. *Descriptions of more than 350 food and flavour plants and their close relatives. For each plant, the following information is given: plant description, origin, history, cultivation, harvesting, properties and culinary uses. 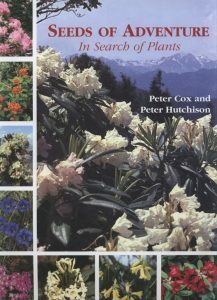 *More than 1000 excellent full-colour photographs, showing the plants, flowers and actual plant parts used. *Introductory chapters on each of the various categories of plant use: cereals, pulses (legumes), nuts & seeds, fruits, vegetables, culinary herbs, sugar plants, beverages, spices & flavourings. *Interesting facts about the historical and contemporary uses of the various plant-derived products. 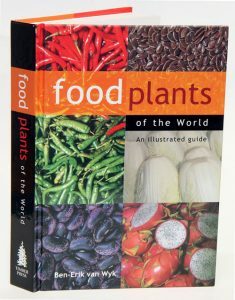 *A quick guide and checklist of more than 800 of the most important and well-known food plants of the world, listed according to scientific name but giving the common names, family name, region of origin, plant parts used, and major nutrients.